Sociology of Immigration Social Stratification Latina/o Immigration to the U.S.
Maricopa County, Arizona, was not a good place to be in the first years of the twenty-first century if you were foreign and of brown skin. A child of Italian immigrants retired from the Drug Enforcement Administration and then turned county sheriff unleashed a veritable campaign of terror against Latin American immigrants, aiming to make the county as inhospitable to them as possible. Sheriff Joe Arpaio was enthusiastically egged on by a white electorate composed largely of retirees from northern states who could not see any contradiction between their hiring of Mexicans and Guatemalans as nannies, maids, and gardeners and the persecution to which Sheriff Joe subjected them. Repeatedly elected by Maricopa citizens, Arpaio devised ever more refined ways of punishing Mexicans and Central Americans unlucky enough to find themselves in Phoenix, Tempe, or the rural areas of the county. While not all of them came surreptitiously across the border, Arpaio and his men acted as if they all were illegal. Brown-skinned people in Maricopa were guilty until proven innocent. Finally, in December 2011, the Federal Justice Department released a report claiming that "Sheriff Joe Arpaio harasses, intimidates and terrorizes Latinos and immigrants, and he's been doing it for years." Sheriff Joe stated that he would not go down without a fight, but faced with the prospect of a massive federal lawsuit, his reign of terror may be coming to an end. The antics of Joe Arpaio in southern Arizona highlight a leitmotif found throughout the history of immigration to America. Although the words at the base of the Statue of Liberty speak of an open country welcoming the poor and wretched of the earth, realities on the ground have been very different.As in Maricopa, foreigners who fuel the local economy with their labor, not only as urban servants but as hands in the fields, have been consistently persecuted by the authorities and denounced by nativists as a threat to the nation. As noted by a number of authors, this peculiar American waltz between labor demand and identity politics has repeated itself in every major period of immigration dating back to colonial days. As we will see, the contradiction between welcoming foreign workers and demonizing their languages and cultures has been more apparent than real, having played into the hands of a number of actors. Sheriff Arpaio's repeated election in Maricopa happened for a reason, as he represented the linchpin of a de facto functional immigration policy. Unraveling these and other riddles of the peculiar relationship between immigration and the development of American society and economy is the goal of this book. We begin the story with the great waves of immigration accompanying the American industrial revolution. As shown in table 1, more than twenty-three million immigrants came to the United States during the last two decades of the nineteenth century and the first two of the twentieth. Certainly, not all of them stayed; many eventually returned home or even engaged in a back-and-forth movement depending on the ups and downs of labor demand on both sides of the ocean. As many as half of certain peasant-origin groups, such as the Southern Italian contadini, went back at some point, while more than 90 percent of eastern European Jews left their places of origin never to return. Be that as it may, the sediment that these human waves left over time was substantial enough to cause significant changes in the demography of the receiving nation. By 1910, the foreign-born accounted for 14.7 percent of the American population and for 22 percent of those living in urban places. The shift from Great Britain and Ireland to Germany and the Scandinavian countries, and then to Italy and Eastern Europe, follows the trail of the industrial revolution in Europe. It at least suggests that immigration to the United States provided a welcome alternative to population groups displaced by revolutionary changes in agriculture and industry; and thus facilitated, in no small measure, the course of industrialization in the European countries. This migration may thus be viewed as an adjustment of population to resources, that in its magnitude and the extent to which it adapted itself to purely economic needs has few parallels in history. On the other side of the Atlantic the European waves were not well received by everyone, but they were welcomed by a politically decisive class, namely capitalists bent on breaking the hold of independent craftsmen and skilled workers so as to meet the demand of a vast market for cheap manufactures. This was no easy feat. As Rosenblum notes, Tocquevillean democracy in America was grounded on independent small producers whose determination to avoid lifelong wage slavery led to a proliferation of enterprises whose craftsmen-owners freely and personally interacted with their journeymen. These, in turn, planned to found their own enterprises in due time. This tradition went hand in hand with the settlement of a vast frontier by independent farmers, whose demand for agricultural implements and manufactured goods created a comfortable synergy with the products of small-scale industrial shops. The challenge for the rising class of capitalist manufacturers was how to break this synergy so that markets could be expanded at home and abroad. As Brinley Thomas demonstrated, immigration prior to the 1870s preceded indicators of economic development such as railway construction and demand for bituminous coal: "That was the pioneering phase when a comparatively small nation was engaged in subduing a continent and the rate of expansion was conditioned by the arrival of new labor. . . . Moreover, the railways could not have been built without the gangs of laborers, many of them Irish, recruited in the East and transported to the construction camps." After 1870, however, the causal correlation reversed itself, and indicators of economic development started to precede mass migration. This is the moment when the "pull" of American wages, advertised by paid recruiters sent to Europe, began to make its mark among Italian and eastern European peasants whose economic existence was rendered increasingly precarious by industrialization in their own countries. As table 1 also shows, southern and central Europeans progressively displaced migrants from the British Isles, Germany, and Scandinavia, as major sources of U.S.-bound migration. Their massive arrival led to a radical transformation in the composition of the American working class, from independent and quasi-independent craftsmen and journeymen to unskilled workers. Naturally, the native working class vigorously, and often violently, resisted the changes engineered by industrial capitalists. Better than any other movement, the Knights of Labor exemplified this resistance. The phenomenal rise in the membership of this order and the bitter struggles that ensued coincided with a rise in factory production that became generalized by the 1880s. The Knights grew in membership from about 104,000 in July 1885 to more than 702,000 one year later: "The idea of solidarity of labor ceased to be merely verbal, and took on flesh and life; general strikes, nation-wide boycotts, and nation-wide political movements were the order of the day. Although the upheaval came with the depression, it was the product of permanent and far reaching changes which had taken place during the seventies and the early eighties." The Knights were, in the end, unsuccessful. The master-journeyman relation was gone forever and, with it, the social basis for democratic equality and self-reliant individualism that were founding elements of the American republic. European migration did not change the fundamental pillars of American society-its elites, its class structure, or its constitutional order; what it accomplished was to alter the demographic composition of the population and, along with it, the character of the American working class. Henceforth, workers became dependent on trade unions rather than independent ownership as their sole basis for "voice" in their nation's political process. European migration accelerated to such an extent that it made the causal order between capitalist development and population displacement uncertain. While originally promoted by capitalist firms through deliberate recruitment to staff the incipient factory system, the movement produced such an abundance of cheap unskilled labor as to trigger new waves of technological innovation to take advantage of it, in the process burying forever the independent artisan class. As Thomas concluded: "The massive inflow into the United States of cheap labour from Southern and Eastern Europe coincided with technical innovations calling for a 'widening' of the capital structure. The changing technique in the expanding industries entailed minute subdivision of operations and a wide adoption of automatic machines worked by unskilled, often illiterate men, women, and children. After 1900, the new supply of manpower was so abundant that firms using the new techniques must have driven out of the market many old firms committed to processes depending on human skill." As shown in table 2, male immigrants around 1910 were overwhelmingly concentrated in the bottom rungs of the occupational ladder. While illiterate or poorly educated first-generation migrants were pretty much stuck at the bottom of that ladder, prospects for the better educated and, especially, for the children born in America were much brighter. As it kept growing, the new industrial economy generated multiple economic opportunities accessible to those with a modicum of education. A universal public-education system opened the doors for such positions to second-generation youths. Naturally, it was the children of earlier immigrant waves-primarily the British, German, Scandinavian, and Irish-who benefited most from such circumstances. They needed a continuous supply of unskilled Italians, Poles, and other eastern European workers to keep fueling a mass industrial economy that was propelling them to positions of ever greater wealth and prosperity. This is a fundamental reason why nativist reactions against the southern and eastern European waves and the consequent identity politics were kept in abeyance until the third decade of the twentieth century. Despite the extraordinary synergies in the transatlantic political economy between Europe and North America, the mass of peasant immigration from Catholic countries of the European periphery could not but awaken sentiments of rejection and hostility among the native-born. Such sentiments and the resulting anti-immigrant mobilizations accumulated over time as the mass of foreigners extended throughout the national territory and as the economic "mobility machine" fueled by their labor slowed down in the wake of World War I. In chapter 5 we will examine in detail the interplay between nativist discrimination and identity politics during this period. The main point here is that the interplay between the economic basis of immigration and the cultural reaction to it was definitely evident during those years. Anti-immigrant sentiment was fueled by a conjunction of groups that saw the relentless flow of foreigners as a direct threat. First, skilled native workers and their organizations were pushed aside by the onslaught of unskilled migrant labor. While the Knights of Labor put forward an ideology of universal brotherhood among all workers and of radical transformation of the capitalist factory system, realities on the ground continuously undermined that ideology and put the confrontation between skilled natives and illiterate foreign peasants into sharp focus. Second, there was a general malaise among the native population at being surrounded by a sea of foreign faces, accents, and religious practices and at finding themselves increasingly cast as "outsiders in their own land." Nativist reactions took multiple forms, from violent attacks and lynching of foreigners to organized campaigns to Americanize them as quickly as possible. In March 1911 the White League, a New Orleans organization akin to the Ku Klux Klan, lynched eleven Italian immigrants accused of conspiring to murder the city's police chief. Six were about to be released after being found not guilty. Their dark Mediterranean features undoubtedly contributed to their instant indictment by the mob. Commenting on the incident, the Harvard intellectual Henry Cabot Lodge characterized it not as a mere riot but as a form of revenge, "which is a kind of wild justice." He characterized the earlier acquittals as "gross miscarriages of justice," since the Italians were undoubtedly active in the Mafia. Cabot Lodge's stance reflected the third set of forces in favor of nativist radicalism: the concern among American intellectuals that so many foreigners would dilute the moral fiber of the nation and the integrity of its institutions. In an academic environment dominated by the social Darwinist evolutionary theories of Herbert Spencer and the "science" of eugenics, the intellectual and moral inferiority of southern and eastern Europeans was taken for granted and their capacity for eventual assimilation into American culture widely questioned. The statistician Richard Mayo Smith warned that "the thing we have to fear most is the political danger of the infusion of so much alien blood into our social body that we shall lose the capacity and power of self-government. "Similarly, in his 1926 volume Intelligence and Immigration psychologist Clifford Kirkpatrick argued against expecting much progress among immigrants through the reform of school programs because "definite limits are set by heredity, and immigrants of low innate ability cannot by any amount of Americanization be made into intelligent American citizens capable of appropriating and advancing a complex culture." Under the intellectual zeitgeist of the time and the leadership of such public thinkers, the restrictionist movement gathered momentum. The movement was reinforced by three major forces in the economic infrastructure. First, as noted by Thomas, the progressive closure of the frontier and the slowing down of the industrialization process began to limit the "economic engine" propelling native workers and members of the second generation on the backs of foreign labor. The mass of newcomers progressively ceased to be the backbone of a segmented labor market and became a source of direct competition for natives. Second, the minority of educated immigrants with union and party experience in Europe and the Americanized second generation mobilized against capitalist exploitation, becoming, in many regions, the backbone of the union movement. The enthusiasm of industrialists for foreign labor cooled significantly when confronted with such unexpected resistance. Immigrants with industrial background were those who contributed primarily to the first radical cohorts in America: "The spirit of a disciplined, intelligent, and aggressive socialist army was typified by the organized working-class movement of Germany. The leaders of this mighty force were deeply respected at home and abroad. It was men trained in such a movement who tried to build up a duplicate in the United States." Events back home also contributed to the radicalization of certain immigrant nationalities, such as Russian Jews and Slavs. As Fine noted, "almost two-thirds of the members of the Workers' (Communist) Party were born in countries which were either part of the old Russian empire or inhabited by Slavs." The horrors of the Triangle Shirtwaist Fire in New York stimulated labor militance in the needle trades. As a result, the International Ladies Garment Workers Union and the Amalgamated Clothing Workers of America, each of which had a largely Jewish, Italian, and Polish membership, developed into two of the strongest labor unions in the United States. Thus, the fundamental function of immigrant labor to American industrialism, which included not only supplementing a scarce domestic labor force but disciplining it through strike-breaking and the acceptance of poor working conditions, gradually weakened.The stage was set for the search by capitalist firms of a new source of pliable labor to replace increasingly militant immigrants and their descendants. The identification of this alternative labor source represented the third economic force buttressing the restrictionist movement that finally triumphed in the mid-1920s. As we will see in the next chapter, the activation of the massive black labor reserves in the American South provided the impulse for the emergence of a split labor market in industry, marked by major differences in pay and work conditions between white and black workers. Descendants of former slaves, previously confined to a semisubsistent agricultural life in the South, were actively recruited by the likes of the Ford Motor Company as early as 1916. The recruitment process was similar to that previously used among southern Italian and eastern European peasants, and the purpose was the same-to supply large manufacturing industry in the American Northeast and Midwest with an abundant, cheap, and unorganized labor source. Because this source was also unskilled, the policy of encouraging southern black migration was accompanied by the acceleration of capital-intensive techniques in manufacturing. With this strategy capitalist firms attempted, and largely succeeded, in breaking the power of the trade unions. From 1920 to 1929 union membership dropped by almost two million. In 1933 it stood at fewer than three million, a precipitous decline from the peak years before World War I. The final victory of radical nativism with the enactment of restrictive legislation by the U.S. Congress in 1924 was, to a large extent, the outcome of the withdrawal of support for immigration by forces in the American economy that had previously supported it. First, natives and members of the second generation shifted attitudes, regarding further immigration as an obstacle and not as a propeller of their own upward mobility. Second, the pivotal capitalist class lost enthusiasm for the foreign labor supply as it became progressively organized. This withdrawal of support accelerated when firms found in southern black peasants a new major source to replace and, if necessary, discipline an increasingly restless white labor force. The size of European immigration after 1890 and the attention bestowed on it by politicians, academics, and the public at large commonly blocked from view what was happening at the other end of the land. Under the Treaty of Guadalupe Hidalgo in 1848, Mexico ceded to its northern neighbor almost half of its territory after its defeat in the Mexican-American War. The physical size of the new acquisition was enormous, comprising the current states of Texas, New Mexico, Arizona, California, Nevada, Utah, and parts of Colorado and Wyoming. The need to integrate these territories into the economy of the nation and the vast opportunities it created generated a strong demand for new labor, to be sourced from west and south. Gold came first. The California Gold Rush of 1848 to 1855 saw adventurers of every stripe attempt the difficult journey west, going as far as the Magellan Strait at the tip of South America to reach the new promised land. The need for labor in the mines led to the first transpacific recruitment system, with paid contractors sent to southern China, in particular the greater Pearl River Delta region around present-day Jiangmen, in search of contract workers. The system was largely responsible for the first appearance of Chinese migrants on American shores. The great difficulties of reaching the Pacific Coast and the need to integrate the vast new territories provided the necessary impetus for transcontinental railroad construction in the subsequent decades. Two great railroad companies-the Central Pacific and the Union Pacific-stood in need of massive supplies of labor that could not be sourced east, especially after the tracks left Iowa and Nebraska to start climbing the Rocky Mountains. Labor for this enormous enterprise came primarily from southern China through a massive expansion of the recruitment system. The two railroad companies, racing east from Sacramento, California, and west from Omaha, Nebraska, finally met in Promontory, Utah, in 1869. Chinese workers whose hands had built mile after mile of track suddenly became redundant. A few returned home, but most stayed because they had not accumulated enough money to pay the costs of the return passage and buy land. They first turned to California agriculture, but their appearance in the fields triggered a furious reaction among natives who regarded the Chinese as semihuman. Chinese immigration was described as "a more abominable traffic than the African slave trade" and the immigrants themselves were depicted as "half civilized beings who spread filth, depravity, and epidemic." The weak Qing Dynasty could do little for its nationals abroad, and the rising xenophobia in California and elsewhere culminated in the Chinese Exclusion Act of 1882, which effectively ended this labor flow. Chinese laborers were pushed out of California farms and ranches and forced to find refuge in tightly knit urban communities that formed the precursors of today's Chinatowns. Hand laundries and cheap restaurants became the means of survival for this confined "bachelors society" where the ratio of men to women reached a remarkable 26:1 in the 1930s. With Chinese laborers out of the land and California agriculture in full bloom, a new source of field labor had to be found. For some time after the mid-1880s, the Hawaii sugar industry had sourced its demand for cane cutters in Japan. The flow now reached the mainland, where the renowned discipline and frugality of Japanese workers made them welcome by California ranchers and farmers, at least for a while. Trouble started to brew when landowners realized that the Japanese coupled these virtues with a strong desire to buy land and farm on their own. In 1900, for example, forty Japanese farmers owned fewer than five thousand acres of California's land. By 1909, however, about six thousand Japanese were farming under all sorts of tenancy, controlling more than 210,000 acres. As Ivan Light has pointed out, "So long as the Japanese remained willing to perform agricultural labor at low wages, they remained popular with California ranchers. But even before 1910, the Japanese farmhands began to demand higher wages . . . worse, many Japanese began to lease and buy agricultural land for farming on their own account. This enterprise had the two-fold result of creating Japanese competition in the produce field and decreasing the number of Japanese farmlands available." Faced with such "unfair" competition, ranchers turned to the ever-sympathetic state legislature. In 1913 the first Alien Land Law was passed, restricting the free acquisition of land by the Japanese. This legal instrument was perfected in 1920 when Japanese nationals were forbidden to lease agricultural land or to act as guardians of native-born minors in matters of property. Driven from the land, the Japanese had no choice but to move into cities, just as the Chinese had done before. They did not huddle, however, in the same restricted areas but fanned out in diverse forms of self-employment. By 1919, almost half of hotels in Seattle and 25 percent of the grocery stores were owned by Japanese migrants. Of Japanese men in Los Angeles, 40 percent were self-employed, operating dry-cleaning establishments, fisheries, and lunch counters. A large percentage of Japanese urban businesses were produce stands that marketed the production of the remaining Japanese farms. The anti-immigrant rhetoric and xenophobic measures pushed by nativists in the West thus ended up by depriving its farms and other businesses of any source of Asian labor, while turning those migrants who stayed into urban entrepreneurs. Farms, ranches, and cities kept growing, however, and the question was what new labor flow could be engineered to replace the departed Chinese and Japanese. Western businessmen borrowed a page from their eastern counterparts by turning south. While northeastern industrialists tapped the large black labor reserves in the former Confederacy, California and Texas ranchers went to Mexico. In both cases the method was the same: deliberate recruitment through economic incentives. By 1916 the Los Angeles Times reported that five or six weekly trains full of Mexican workers hired by the agents were being run from Laredo. According to Mario García, the competition in El Paso became so aggressive that recruiting agencies stationed their Mexican employees at the Santa Fe Bridge, where they literally pounced on the immigrants as they crossed the border. As seen in table 3, Mexican immigration surged after 1910 as a consequence of these developments-a flow that was intensified by the turmoil of the decadelong Mexican Revolution. Free access to Mexican labor conflicted, however, with the increasing exclusionary mood back east. The history of immigrant regulation from the end of World War I to the Great Depression is a case study of governmental efforts to reconcile seemingly incompatible demands through legislative compromise and administrative regulation. Direct attempts by western ranchers and growers to beat back restrictionism at the federal level were defeated. In 1918, however, an exception to the ban on illiterates was granted by Congress in favor of immigrants from Mexico and Canada. The 1924 National Origins Act again exempted Mexico and other Western Hemisphere countries from the quota imposed on the Europeans. In 1929 a Supreme Court decision upheld an earlier administrative decree declaring workers who commuted between residences in Mexico and jobs in the United States to be legal immigrants. In effect, through various loopholes and administrative devices, the federal government endeavored to keep the "back door" of immigration open to Western capital, while closing it to new southern and eastern European migrants. For reasons we have already seen, Europeans had ceased to be a preferred source of unskilled industrial labor, but while their replacements could be sourced from domestic labor reserves, the same was not the case in the West. There, foreign workers, this time from south of the border, continued to be in high demand for many years as the human instruments to fuel an expanding economy. Mexican migration possessed another convenient feature: its cyclical character. Because the border and their home communities were relatively close, Mexican migrants found reverse migration a much easier enterprise than did Europeans or Asians. Indeed, the normative behavior among Mexican male workers was to go home after the harvest or after their contract with railroad companies had expired. This practice, together with the predominately nonurban destinations of the Mexican labor flow, reduced their visibility, making them a less tempting target for nativist movements of the time than the Italians and Poles. That honeymoon period was short-lived, however, as we will see shortly. While the history of U.S.-bound immigration before the 1930s evidenced few parallels between the eastern and western regions, a decisive feature was common to both: the conflicting interplay between political economy and identity politics. Growing industrial and agricultural economies consistently demanded and received immigrant labor flows, while the presence of many foreigners inevitably triggered a nativist backlash. That reaction was prompted by the perception of immigrants as labor-market competitors and as sources of social and cultural fragmentation, as well as by the behavior of some foreign groups that sought to assert their labor rights and their rights to self-employment in America. When that happened, the protective hand of the employer class quickly withdrew, leaving the newcomers to their own fate. The literature on international migration generally makes a great deal over the changes that such flows wreak in the host societies, often proclaiming that they "transform the mainstream." These assertions confuse impressions at the surface of social life with actual changes in the culture and social structure of the receiving society. While major immigration movements, such as the great transatlantic and transpacific waves before and at the start of the twentieth century, can have great impact on the demographic composition of the population, it is an open question whether such changes also lead to transformations in more fundamental elements of the host nations. In the case of the United States it is clear that, despite much hand-wringing by nativists of the time, the value system, the constitutional order, and the class structure of American society remained largely intact. Native white elites kept firm control on the levers of economic and political power, and existing institutions, such as the court system and the schools, proved resilient enough to withstand the foreign onslaught and to gradually integrate newcomers into the citizenry. It is a commonplace that assimilation is a two-way street, with both the host society and foreign groups influencing each other. In the American case, however, the process was definitely one-sided, as existing institutions held the upper hand. Eventually, children and grandchildren of immigrants began ascending the ladder of American economy and the status system, but to do so, they had first to become thoroughly acculturated, learning fluent English and accepting the existing value system and normative order. It is important at this point to distinguish between the structural significance and the change potential of migrant flows. There is no question that the great early twentieth-century migrations had enormous structural importance for the American economy. They were the sine qua non for the industrial revolution of the time, and this was, from the point of view of white American elites, almost their sole raison d'être. That effect did not so much change American society as reinforce its existing structures of wealth and power. The actual social transformations wrought in the fabric of society by these flows came largely as unanticipated consequences of their numbers and their cultural backgrounds. 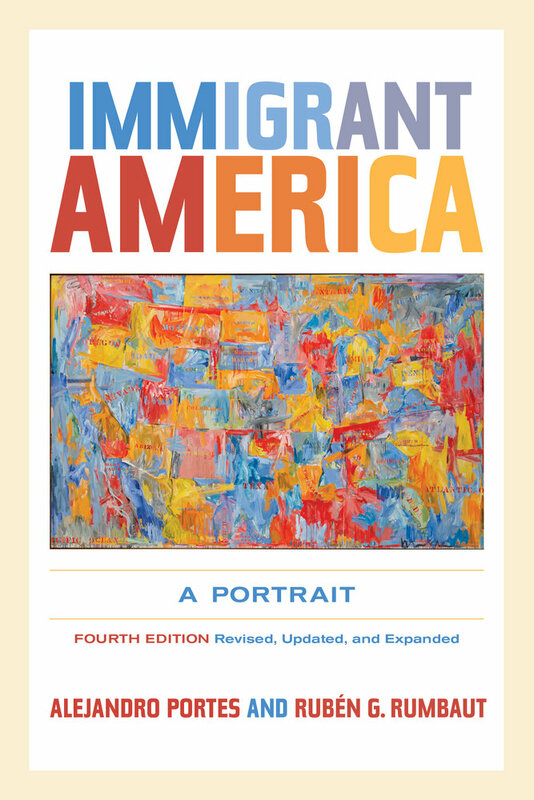 This revised, updated, and expanded fourth edition of Immigrant America: A Portrait provides readers with a comprehensive and current overview of immigration to the United States in a single volume. Updated with the latest available data, Immigrant America explores the economic, political, spatial, and linguistic aspects of immigration; the role of religion in the acculturation and social integration of foreign minorities; and the adaptation process for the second generation. 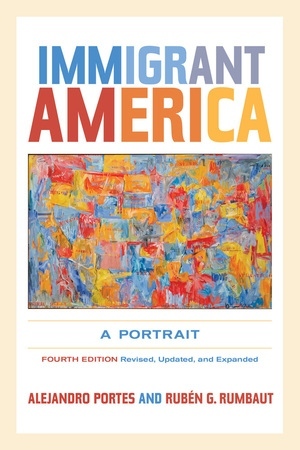 This revised edition includes new chapters on theories of migration and on the history of U.S.-bound migration from the late nineteenth century to the present, offering an updated and expanded concluding chapter on immigration and public policy. Alejandro Portes is Professor of Sociology and founding director of the Center for Migration and Development at Princeton University and Research Professor at the University of Miami. Rubén G. Rumbaut is Professor of Sociology at the University of California, Irvine, and founding chair of the International Migration Section of the American Sociological Association. They are the coauthors of Legacies: The Story of the Immigrant Second Generation and coeditors of Ethnicities: Children of Immigrants in America. "Tensions that Make a Difference: Ideologies of Immigration and Public Policy." Lecture by Dr. Alejandro Portes at The University of Georgia, March 27 2015.